People tend to buy this excuse. It seems like a pretty good rationalization. "I could either spend 20 bucks at the movie theater or $20 playing blackjack at the casino. It's all just entertainment." However, if someone wanted to go to a stripclub with that same logic, the argument isn't as strong. That's because we tend to understand that the underlying moral failings behind a stripclub is 'lust'. However, we call the moral failing of a casino, 'gambling', when it's really 'greed' and 'jealousy'. So, if you believe that the desire for money you didn't "earn" is wrong, and that risking your money on a game of chance that is not in your favor is stupid, then the next time someone says they're going gambling for entertainment, ask them if they would be just as happy playing cards at a buddy's house for no money. If not, then the gaming part isn't the recreation for that person. It's the quick possibility at wealth that's so entertaining. Isn't there a difference though between playing blackjack at a casino and poker with friends, even if for money? The blackjack dealer is heavily favored otherwise it wouldn't be a casino game. "Cause the house always wins. Play long enough, you never change the stakes. The house takes you. 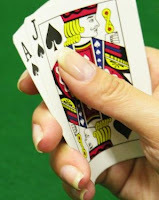 Unless, when that perfect hand comes along, you bet and you bet big, then you take the house." It is indeed foolish to gamble at the casino and think you're going to come out wealthy. But in a game of poker with your buddies, someone will leave with money. Your chances may be just as slim depending on who you're playing with, but you're not playing the house and you at least know exactly where the money is going and in a tight situation could ask that person for a couple bucks... I guess my justification for poker nights is that it is more like going to a movie and spending $20 because it's ok if I leave without the money. If I leave with the money, well then I succeeded in fooling my friends into thinking I'm a good poker player! yes, by playing hold 'em with friends, you've gotten rid of the odds premise of a casino. But, why can't you just play for fun instead of money? Because the excitement behind gambling is a lust for money, no? Is it necessarily a lust for money, or is there an intrinsic excitement simply in having something at stake, with the feelings of risk adding to the fun? perhaps it's the something at stake, but i think a lottery case study would conclude that it's not what's at stake, but the hope of what could be gained. There is some degree of difference (don't know how much) between playing the lottery, and playing blackjack or poker. Blackjack and poker are games involving skill; the lottery does not involve skill and therefore does not engage the mind in the same kind of way. There must be a thrill in being good at and winning a game involving skill that is separate from the thrill of winning money. This difference does not necessarily override the destructiveness of gambling (in my mind, an addiction issue rather than a moral one, but a tremendous problem nevertheless), but it may mean that there can be a separate and healthier aspect of playing a game of skill. That is very true. It's more fun to play a game of basketball that includes points rather than just shooting around. So, there is definitely an argument that natural competition can be healthy. However, adding money to this equation changes everything. You're not just playing to win anymore, you're playing to win something very specific and can get very depressed about losing this thing as well.